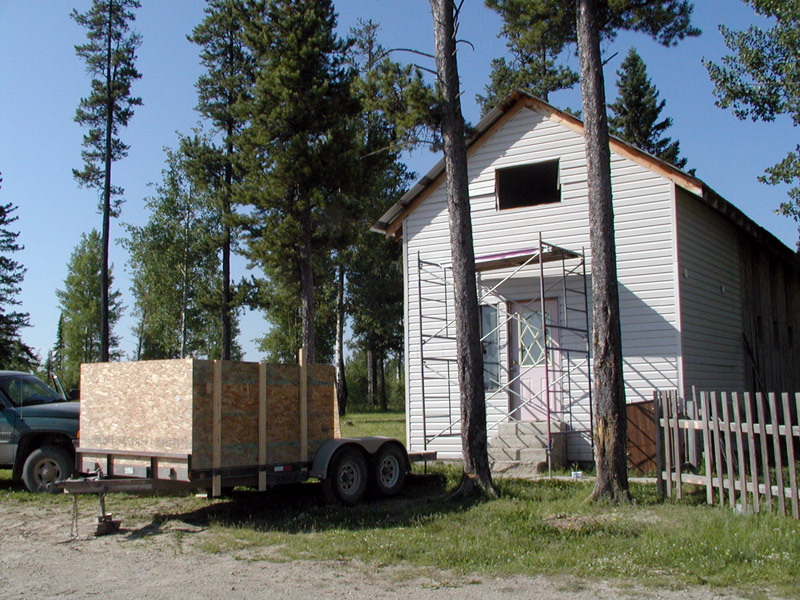 In July of 2006 we made the decision to renovate the mission at Sunchild so we could start using it again for VBS and Services. We had moved away in 2001 and had no plans to return. 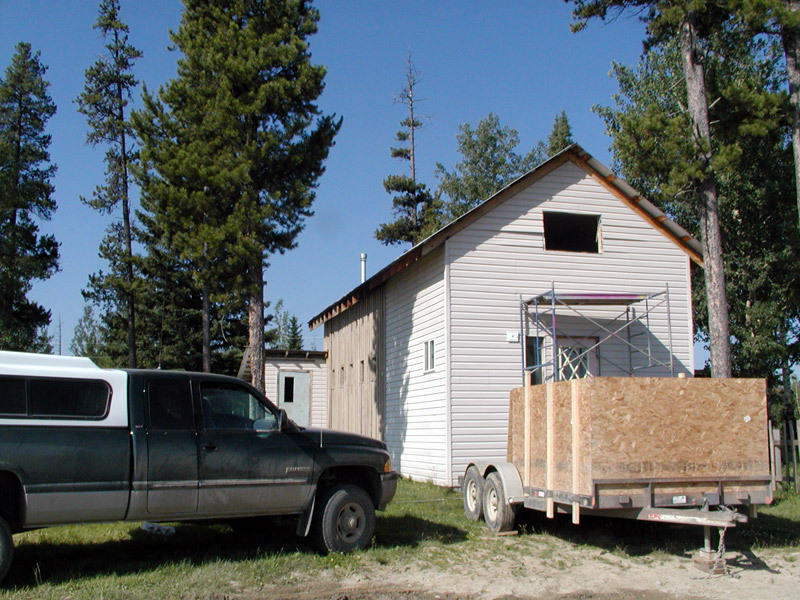 No one was available to fill in for us, and since nobody owns property on the Reserve the buildings were turned over to the Band administration and people moved into our house. No one 'lived' in the church and it was seriously vandalized, partly dismantled, and filled with trash. It was as if the Devil was showing his hate but was unable to destroy it. When we began to bring the Bible College students from Prairie Bible College to do their student ministry assignments on the Reserve, the response was so great it became apparent we needed to re-open the church. The Lord burdened the heart of a lady in Ontario to send two thousand dollars for materials to renovate. A different family had moved into the house and they wanted us to re-open the church. So we decided to try to get it usable in time for our July VBS. One of the big jobs was to replace the entire window unit at the front of the upstairs level. I rented a scaffold from Rocky Mountain House, 40 miles away, and spent a day working on this project. This evening, May 6th, 2008, I stumbled across a couple pictures that I took that day and didn't know I had, so I decided to write this story because the pictures confirmed to me what happened. It's important to emphasize that I was completely alone the entire day, no one was home next door, and no one came by all day long. At the end of the day I had come down off the scaffold and was standing there enjoying the nice new window when I noticed some large writing on the siding under the window. I climbed back up to examine it and couldn't believe what I saw. 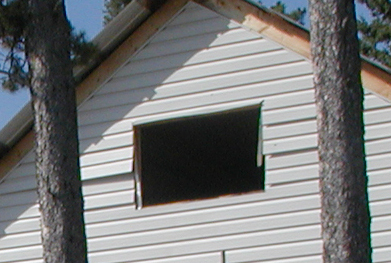 As you can see in the picture, just below the window, there is no writing on the siding. The spot was right in front of me all day long and nothing was there all day, but in just a few moments after I climbed down the writing suddenly appeared. It was written with a kind of heavy dust or soil, and it could easily be brushed off with my hand. What it said was simply, "I hate you" and was followed by several weird symbols which made no sense to me and I didn't recognize as ever having seen before. The 'e' on the word hate was obscure or had been smudged, but the rest was perfectly clear. Below are the two pictures I took in the middle of the day in which you can see that there was 'No' large writing under the window during the day. These pictures are resized for the purpose of file size, but with the originals on my computer I can significantly enlarge them down to the individual pixels and there is absolutely nothing there. Below these pictures I will continue with the 'rest of the story'. I studied this writing for considerable time and then I simply wiped it away so easily that it was obvious a light rain shower would have taken it away. I struggled for some time trying to imagine how I could have missed seeing this all day right in front of my eyes, until I had to admit to myself this would have been impossible. I was shaken enough that it never entered my mind to try to take a picture of the writing, but my emotions were such that I only wanted to get it off the wall and not see it any more. I was really in a fog and somewhat in denial that this was really happening to me. That night, a rock came through a window, and it was obvious to me that no human had thrown the rock but it was part of this spiritual attack. I was not only extremely depressed but physically weakened for the next several days. Our efforts seemed hopeless and futile in the face of such a physical manifestation of evil in the sense that all we were doing must certainly and easily be destroyed. After a couple of days I thought about the three graves of our children behind the church and I felt angry. The graves represented what we had given here. There was nothing we could face now compared to that, and I began to feel angry. I determined that I was going to finish this job, I was going to spend everything we had on it, and I was going to do it the best I could, and I did. In conclusion I'm very happy to report that to this day nothing has touched or hurt any part of this building. The battle goes on in the ministry and we struggle, but it seems to me that if evil hates us so much, it must be because God is at work here and something must be happening. Because I hate evil and I love righteousness it is actually joy beyond compare if it is really true that the Devil hates me! So there it is, I would never have chosen this to happen, and I'm ashamed to report it, but I received an actual letter from hell.